The limited-batch flavor looks to differentiate itself from other smores-inspired flavors by going with new toasted marshmallow ice cream as a base and adding a chocolate cookies swirl into the mix to go with graham cracker swirls and fudge flakes. Gimme S'mores! 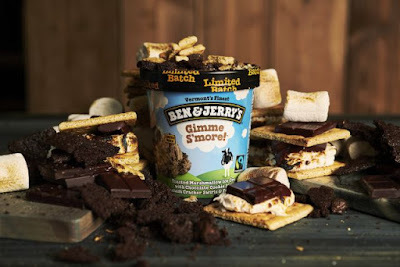 is basically a limited-time twist on the brand's own regular S'mores flavor which consists of chocolate ice cream with fudge chunks, toasted marshmallow, and graham cracker swirls. In addition to pints at retailers and Scoop Shops nationwide (as well as online at store.benjerry.com, you can find the new ice cream flavor in a special sundae exclusively at participating Ben & Jerry's Scoop Shops. The suggested price per pint is $4.89.